Ranger is an incredible young male out of Lily's first litter. He has personality plus, a striking conformation, big running and awesome in the field. We share this great lad with Betty (Gayle's mom) Gayle, Rebecca and Jack Burke in a co-ownership. 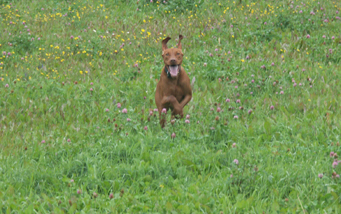 Ranger's first show was in Trenton, N. S. at 6 months of age, owner handled. He picked up his first 4 points. Because we recognized what a great pup we had, we decided to put him with a professional handler for his next show in Norwood, Ont. Deanna Ross took him to his Championship on the 2nd day of showing with points to spare. 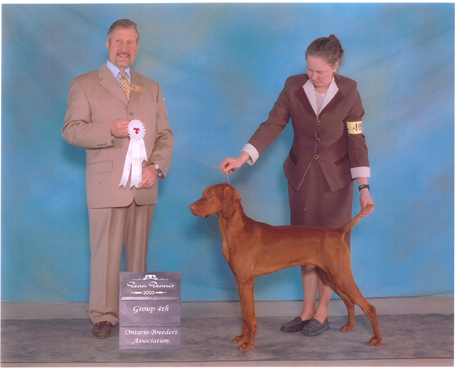 His next show was in Belleville, Ont at the Vizsla Booster where handler David Carr, stepping in to help Deanna took him to his first Best Puppy in Group - at just under 7 months of age!! 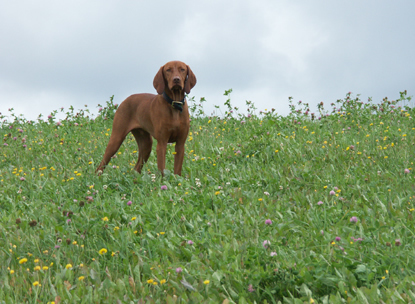 Before his first birthday, Ranger earned another Best Puppy in Group as well as a Group 4th, taking the breed from a large entry, including specials. 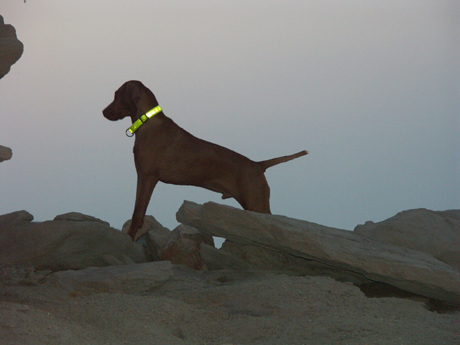 Since then, he has earned 5 more Group 4ths and 1 Group 2nd as well as taking Best Puppy in Speciality Sweeps at the Vizsla Canada Speciality in Woodstock in July 9, 2005. Unlike his sister Bree, Ranger loves the show ring and we will continue to special him for the next year or so as long as he is enjoying it. No slouch in the field, trained and handled by Liz Outram, Ranger earned his FDJ title in 3 straight tries. She also ran him in the NAVHDA Natural Ability Test where he earned a Prize I with a score of 108 out of a possible 112 points. He lost 4 points because he does not hold his point quite long enough. This will come with maturity. We have put his field training on hold for now as it conflicts with his show career. 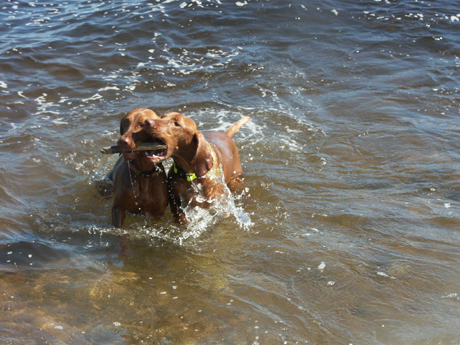 Ranger is retired, enjoying life with his nephew, Edge and his human family in Campbellford, Ontario.